Callan Bentley begins his description of the Wilson Cycle. A full morning of exciting geology activities awaited about a dozen members of Headwaters Chapter of Virginia Master Naturalists who made the trek to Fort Valley Community Center. But before the learning began there was time for a bit of socializing over coffee, juice, and pastries between members from each of the chapter’s three classes. First up was Callan Bentley’s high energy presentation on the Wilson Cycle, the process by which continents collide to form supercontintents and then rift to form small and more continents. Using layman’s terms and stunning graphics, Bentley, an assistant professor of geology at Northern Virginia Community College in Annandale, described how the collisions and rifts of supercontinents of Rodinia (between 1.1 billion and 750 million years ago) and Pangaea (between 300 million and 200 million years ago) reformed rocks while creating folds in the Earth’s crust that formed Virginia’s mountains. 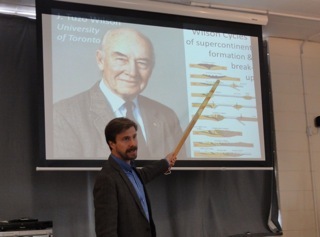 Saying “the present is key to the past,” Bentley explained how current geological processes along with fossil evidence, the continuity of mountain chains, and paleomagnetic studies support the theories of continental drift. After a short break, Dr. Eric Pyle, a geology professor at JMU, lead a hands-on presentation called “Sticky Rocks.” Not having millions of years and the tremendous heat and pressure of continents crashing into each other to “make and remake rocks,” we used a toaster oven, hard candy, and rock samples to recreate some of the common, and commercially valuable, rocks found across the Commonwealth. A specialist in geoscience education, Dr. Pyle used his demonstration to not only teach Headwaters Master Naturalists, but to demonstrate how science education can be fun and assessable to all ages. Wrapping up the day, Callan Bentley made a brief presentation on “Snowball Earth” explaining how some 650 million years ago the Earth’s surface was believed to be almost totally frozen. The theory offers answers on how glacially formed sedimentary deposits are found in tropical regions. Headwaters Chapter shouts out a big Thank You to Callan Bentley and Eric Pyle for enlightening and entertaining us. Thanks also to RoxAnna Theiss for organizing the symposium and to Fort Valley Community Center for the generous use of their facility. Master Naturalists enjoy refreshments as the Geology Symposium begins. One rock took millions of years and high heat and pressure to create. The other we “cooked up” in about an hour! Eric Pyle discusses rocks of Virginia’s geological regions. Our manmade rock and the real thing. December 24, 2013 in Training.